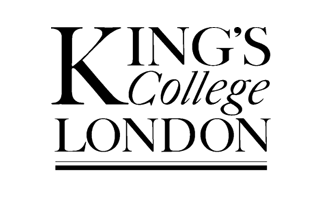 King's Health Partners (KHP) ECMC combines research activity within King’s College London with clinical expertise in the Comprehensive Cancer Centre based at the College’s two partner NHS Foundation Trusts, Guy’s & St Thomas’, and King’s College Hospital. 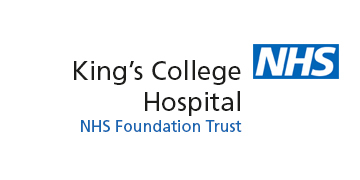 Areas of expertise include cellular and molecular immunotherapy, imaging (allied to the Comprehensive Cancer Imaging Centre, a joint centre with UCL), and the development of devices for cancer surgery. KHP ECMC is hosted within the Guy's Clinical Research Facility, which is MHRA-accredited as a Phase 1 unit. Cell therapy and protein GMP production facilities are located at Guy's and King's College Hospital Campuses. Translational laboratory fcilities are provided within the new £160m Guy's Cancer Centre opened in 2016. Professor Arnie Purushotham has been a Consultant Surgeon and Clinical Academic for 20 years having worked in Glasgow, Cambridge and London. He is the joint Lead of the KHP ECMC, and has been the Professor of Breast Cancer at King’s College London and Consultant Surgeon at Guy’s and St Thomas NHS Foundation Trust since 2005. As a scientific researcher for the last 25 years, Professor Purushotham’s goal has been to drive high quality clinical and translational research that directly impacts on breast cancer patients. Key areas of research are in understanding clinical and genomic patterns of metastatic spread, pathophysiology of lymphoedema, sentinel lymph node biopsy, novel intra-operative imaging, cancer, evolutionary biology & cancer outcomes. The randomised controlled trial he led in sentinel lymph node biopsy has been practice-changing. He is also the CI for global first-in-woman in vivo studies using Terahertz technology and Cerenkov luminescence imaging to detect malignant tissue at margins of surgical excision with a view to reducing the re-excision rate in breast-conserving surgery. Professor James Spicer is a Consultant in Medical Oncology at Guy’s and St Thomas’ Hospitals, and Professor of Experimental Cancer Medicine at King’s College London. His clinical interests include the care of patients with thoracic malignancies, including lung cancer and mesothelioma, and clinical trials in these diseases. He set up and runs his hospital’s Cancer Phase 1 trials programme. His translational research focus is on the development of novel immunotherapies. The KHP ECMC team has a strong track record in the development and preclinical testing of cell therapy agents which use the patient’s own immune cells in a range of cancers. Recently, KHP scientists have developed a groundbreaking approach in head and neck cancer called T4 immunotherapy. The T4 immunotherapy exploits prevalent and fundamental mechanisms by which aberrant upregulation of the ErbB network drives tumorigenesis in Squamous Cell Cancer of the Head and Neck (SCCHN). The patient’s immune cells (T-cells) are modified using a safe virus to express two new fusion proteins and are then expanded in culture for 2 weeks. The first fusion protein is a Chimeric Antigen Receptor (CAR) that enables T-cells to recognize and kill tumour cells that express any of a range of ErbB receptor pairs. The second fusion protein facilitates the expansion process, rendering manufacture of cell products more robust. The preclinical results were so encouraging that Dr John Maher received a Wellcome Trust Translation Award to bring this treatment forward to the clinic. 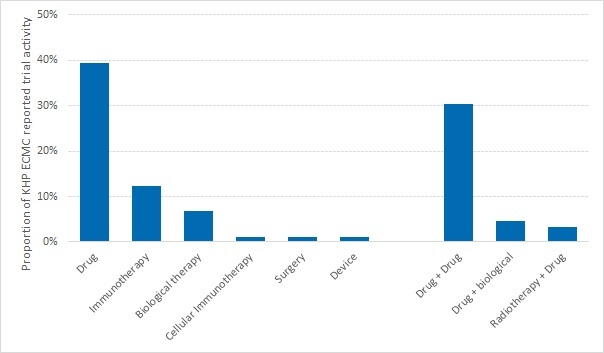 The goal of this open-labelled, non-randomized, dose-escalation phase I trial is to investigate the safety of T4 immunotherapy when administered to treat loco-regional disease in SCCHN that is not suitable for conventional active therapy. The need for better treatments is welcomed as unlike many other cancers, the primary cause of mortality in head and neck cancer is locally advanced disease rather than metastasis. 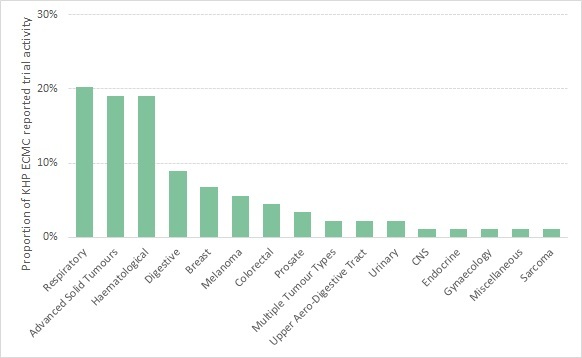 Guys & St Thomas Breast Tissue & Data Bank: HTA licensed bank collected over the last 30 years with 7,200 fixed, paraffin-embedded primary tumours, 2,500 frozen primary tumours, and 900 matched tumour and blood DNA samples. All samples have associated, prospectively acquired pathological and clinical data. National Leukaemia Cell Bank and Myelodysplastic repository held on the Denmark Hill campus. Cutaneous lymphoma tissue bank and developing melanoma tissue bank. ECMC funding provides infrastructure support for early phase and translational research. From the ECMC KHP portfolio, the following trials have been carried out.